For adoptive families—and hopeful parents—living in Connecticut. ALL TOGETHER NOW (ATN) FALL 2014 Adoption Playgroups for 3-9 Year-Olds Tweens Peer-Support Group Teen Mentor Program Parent Discussion Group Five Sunday Sessions: 2:00-3:30 PM September 14, October 19, October 26, November 16, December 7 Union Temple Preschool 17 Eastern Parkway Brooklyn, NY 11238 ATN �” now in its sixth year �” is a non-profit group that offers a range of adoptee-focused programming for ages 3 through adult. For Preschool and Elementary School Children: Fun, multiracial playgroups, facilitated by adult and teen adoptees for adopted kids from a wide spectrum of backgrounds. A committee of resourceful and dedicated adult adoptees, adoptive parents, and teen adoptee volunteers organize the playgroups and their activities. 3-5 year-olds; 6-9 year-olds: Free and group play that incorporates adoption- and identity-related activities and themes. Themes around identity, family and friends will be explored. Activities include Family Day, an outing to Prospect Park; puzzle and quilt making; and performances from special guests. The groups provide a “safe space” for kids to build relationships within the adoptive community. The playgroups are facilitated by adult adoptee Program Supervisor Marissa Martin, LMSW, director of Government Affairs at The Coalition for Asian American Children and Program Coordinator Linda Gregory, a medical social worker at New York Presbyterian, Columbia Medical, and transracial adult adoptee. They are assisted by adult adoptee and ATN graduate Peter Flachner, and a corps of committed Teen Mentors. Kacy Ames-Heron, LCSW and transracial adoptee, serves as Program Advisor for the children’s groups. She collaborates in planning the curriculum and provides additional support to facilitators. For Tweens: A peer-support group for 10-12 year-olds that embraces issues, as they come up, in a fun and nurturing environment. The group is facilitated by Irene Pitkowsky, an adult adoptee of Dominican descent, who is passionate about helping families nurture healthy formation of identity from a place of authenticity. Irene has a BA in Sociology and plans to pursue studies to become an adoption therapist. She and her family are active in APC (Adoption Parents Committee). The group offers tweens the opportunity to connect and chat about “what is really cool - and may not be so cool - about being adopted.” The goals of each group session are: (1) to create a safe and open space for tweens to share their joys and pains, as they relate to successfully navigating the burden and dignity of difference; (2) to address a myriad of “hard situations” that arise where we live, learn, and play; and (3) most importantly, to have fun in the process of finding the living and breathing answers to: “Who am I? Who are we?” For Teens: The Teen Mentor Program creates opportunities for 13-18 year-olds to facilitate peer supportive playgroups for adopted children, ages 3-9 years, while acting as role models in adoptee-focused activities. Our adult adoptee team, in turn, provides supervision and mentorship to the teens to foster growth, development, and exploration. A small stipend and community service credit is available for teen mentors. April Dinwoodie, an American-born, transracial adoptee, who is the chief executive of the Donaldson Adoption Institute, heads up the mentor program. She brings decades of personal and professional experience to the position. Please follow this link to register for the teen mentor program: https://docs.google.com/forms/d/1YBoneE7-dgDALTrL1xQ6fEJyy7Z1GRFwmVpmeBut9u8/viewform For Parents: ATN provides a space for adoptive parents to gather, connect, share resources and discuss adoption-related issues. All sessions will be led by our adult adoptee liaison, Julie Young, attorney, author of the blog, “Heart and Seoul,” and editor of KoreanAmericanstory.org. Parents of 3-9 year olds, tweens, and teen mentors are all welcome. Please follow this link to register for the children’s, tweens or parents groups: https://docs.google.com/forms/d/1w5GtDuFpWys-O9NwG-O8qFLETL6BDg1QH1ZJQ92OikM/viewform Programming · Sept 14: Meet-and-greet and general introduction. · Oct 19: Film essayist John Sanvidge, a transratial adult adoptee, will introduce and discuss his recent projects. · Oct 26: Adoption-themed documentary, such as “Approved for Adoption.” · Nov 16: Family Day, in which kids, parents and facilitators come together in an activity-driven group meeting, aimed at building a sense of connectedness within ATN. · Dec 7: Theme to be generated by parent group members. Fees The fee per semester for the children’s and tweens groups is $250 per child and goes directly to our operating costs, to pay for the space rental or for adoptee volunteers and facilitator stipends. The parents group is free for families that are registered for the children’s and tweens groups. The fee for parents of teens is $85. Who We Are ATN is a not-for-profit, adoptee-centered support group for adopted children and their families. We believe that adoption comes with unique developmental processes for adoptive families and that they differ from biological families for that reason. We particularly value the perspective of adult adoptees, seek their input, and support their concerns as an integral part of our program. We strive to create a community in which adopted children, teens and adults can determine their own experience and form supportive friendships among themselves. As parents, we try to understand and integrate the birth cultures of our children into our families’ lives. We recognize the role race plays in this context and especially how it affects the lives of families with children of color. We work to help prepare those kids for the particular challenges of being adopted persons of color. We acknowledge the birth family as a living reality in the adoptive family. We are also attuned to the losses experienced in adoption, especially those of our children and birth families, and treat them respectfully. Finally, we celebrate the diversity of adoptive families and the lifelong, nurturing, loving, unconditional and irrevocable bonds they form. ATN groups offer support to children and parents. ATN is not a therapy provider. For more information: Kids playgroups: registration@ alltogetheradoption.org Tweens group: tweens@ alltogetheradoption.org Teen program: teens@ alltogetheradoption.org ATN Board Kacy Ames-Heron Carol Lutfy Amy Appelbaum Marissa Martin Andrea Compton Emily Morgan Jamie Levinson Margaret Scott Frank Ligtvoet Fran Weinstock https://www.facebook.com/pages/All-Together-Now/729057370439459 Please like us on Facebook! ALL TOGETHER NOW (ATN) SPRING 2014 Adoption Playgroups for 3-9 Year-Olds Tweens Peer-Support Group Teen Mentor Program Parent Discussion Group Five Sunday Sessions: 2:00-3:30 PM Feb 23, March 2, April 6, May 4, June 1 Union Temple Preschool 17 Eastern Parkway Brooklyn, NY 11238 ATN �” now in its sixth year �” is a non-profit group that offers a range of adoptee-focused programming for ages 3 through adult. For Preschool and Elementary School Children: Fun, multiracial playgroups, facilitated by adult and teen adoptees for adopted kids from a wide spectrum of backgrounds. A committee of resourceful and dedicated adult adoptees, adoptive parents, and teen adoptee volunteers organize the playgroups and their activities. 3-5 year-olds; 6-9 year-olds: Free and group play that incorporates adoption- and identity-related themes. Activities include arts and craft projects, group games, movie time, performances from special guests, and outings to the park. The groups provide a “safe space” for kids to build relationships within the adoptive community. Adult adoptee Linda Gregory, MSW Graduate Student at Columbia University, and adult adoptee and ATN graduate Peter Flachner facilitate, with the support of 10 teen mentors. For Tweens: A peer-support group for 10-12 year-olds that embraces issues, as they come up, in a fun and nurturing environment. This separate, but related ATN group is facilitated by Tara Linh Leaman, an adoptee of Vietnamese and African-American descent, who is passionate about helping families nurture healthy formation of identity from a place of authenticity. She is the co-founder and vice president of AmerAsians Building Bridges, Inc., and currently serves on the board of Holt International Children’s Services. The group offers tweens the opportunity to connect and chat about “what is really cool - and may not be so cool - about being adopted.” The goals of each group session are: (1) to create a safe and open space for tweens to share their joys and pains, as they relate to successfully navigating the burden and dignity of difference; (2) to address a myriad of “hard situations” that arise where we live, learn, and play; and (3) most importantly, to have fun in the process of finding the living and breathing answers to: “Who am I? Who are we?” For Teens: The Teen Mentor Program creates opportunities for 13-18 year-olds to facilitate peer supportive playgroups for adopted children, ages 3-9 years, while acting as role models in adoptee-focused activities. A small stipend and community service credit is available. April Dinwoodie, an American-born, transracial adoptee, who is the chief executive of the Donaldson Adoption Institute, heads up the mentor program. She brings decades of personal and professional experience to the position. Registration is closed for the Spring semester. 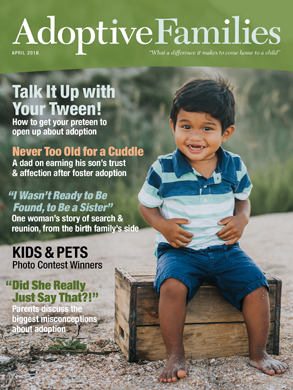 For Parents: ATN provides a space for adoptive parents to gather, connect, share resources and discuss adoption-related issues. Our adult adoptee liaison is Marissa Martin, president of Also-Known-As, an organization which seeks to empower adult international adoptees. Marissa lends her expertise and a multi-faceted point-of-view to the parents group programming. Parents of 3-9 year olds, tweens, and teen mentors are all welcome. Programming • Feb 23: The first session, a general introduction, will be facilitated by Julie Young, attorney, adoptee, author of the blog, “Heart and Seoul,” and editor of KoreanAmericanstory.org. • Mar 2: Milton Washington, an adoptee of Korean and African-American descent, will lead a discussion on the documentary, “Closure” which follows a young African-American woman in her search for her birth family. Milton is currently wrapping up his own memoir, “Slickyboy.” • April 6: Trauma expert and adult adoptee Beth Dobrish will make a presentation on strategies for parenting the traumatized child. • May 4: Family Day, in which kids, parents and facilitators will come together in an activity-driven group meeting, aimed at building a sense of connectedness within ATN. • June 1: Writer, journalist and birthmother Lorraine Dusky, a tireless advocate for the rights of first mothers, and co-founder of the website, [Birth Mother] First Mother Forum (http://www.firstmotherforum.com), will offer her perspective on the adoption process. Lorraine’s memoir, “Birthmark,” published in 1979, was the first of its kind. Highly controversial then, it is still highly relevant today. Fees The fee per semester for the children’s groups is $215 per child and goes directly to our operating costs, to pay for the space rental or for adoptee volunteers and facilitator stipends. The tweens group fee is $250 per child. The parents group is free for families that are registered for the children’s groups. The fee for parents of tweens and teens is $85. Who We Are ATN is a not-for-profit, adoptee-centered support group for adopted children and their families. We believe that adoption comes with unique developmental processes for adoptive families and that they differ from biological families for that reason. We particularly value the perspective of adult adoptees, seek their input, and support their concerns as an integral part of our program. We strive to create a community in which adopted children, teens and adults can determine their own experience and form supportive friendships among themselves. As parents, we try to understand and integrate the birth cultures of our children into our families’ lives. We recognize the role race plays in this context and especially how it affects the lives of families with children of color. We work to help prepare those kids for the particular challenges of being adopted persons of color. We acknowledge the birth family as a living reality in the adoptive family. We are also attuned to the losses experienced in adoption, especially those of our children and birth families, and treat them respectfully. Finally, we celebrate the diversity of adoptive families and the lifelong, nurturing, loving, unconditional and irrevocable bonds they form. ATN groups offer support to children and parents. ATN is not a therapy provider. For more information: Kids playgroups: Amy Appelbaum apricot2K @aol.com Tweens group: Carol Lutfy clutfy @gmail.com Teen program: April Dinwoodie april.dinwoodie @gmail.com ATN Board Kacy Ames-Heron Carol Lutfy Amy Appelbaum Marissa Martin Andrea Compton Emily Morgan Nanne Dekking Jane Rosenberg Jamie Levinson Margaret Scott Frank Ligtvoet Fran Weinstock https://www.facebook.com/pages/All-Together-Now/729057370439459 Please like us on Facebook!